Sunshine, lollipops and rainbows, everything that’s wonderful is what I feel when we’re together … that catchy Leslie Gore tune is the one you could be singing if fortunate enough to grab yourself a Dylan’s Candy Bar Maclaren stroller! When Maclaren teamed with the famous Dylan’s Candy Store in New York City to design a gorgeous new stroller, who knew what to expect? A licorice allsort on wheels perhaps? Maclaren fans will be thrilled that the Dylan’s Candy Bar stroller is based on the Volo frame. Suitable for children aged from six months, this lightweight Maclaren stroller has a quick five second single hand fold which releases and folds again with ease. Dylan’s Candy Bar have put their scrumptious stamp on it with a multicoloured layered stripe print hood and fabric trims as well as a coordinating seat liner, all making for a super sweet ride. 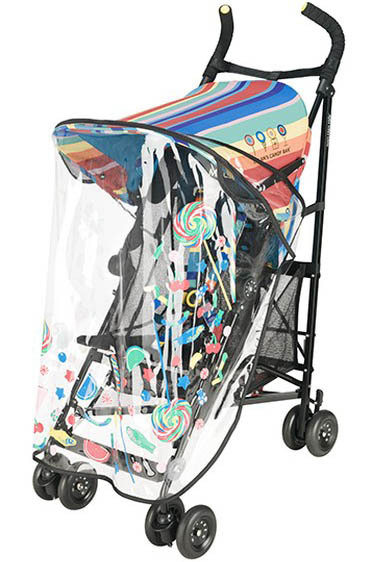 Dylan’s exclusive Candy-Spill printed raincover is cute as ever and will have your pram passenger thinking it’s raining sweets! 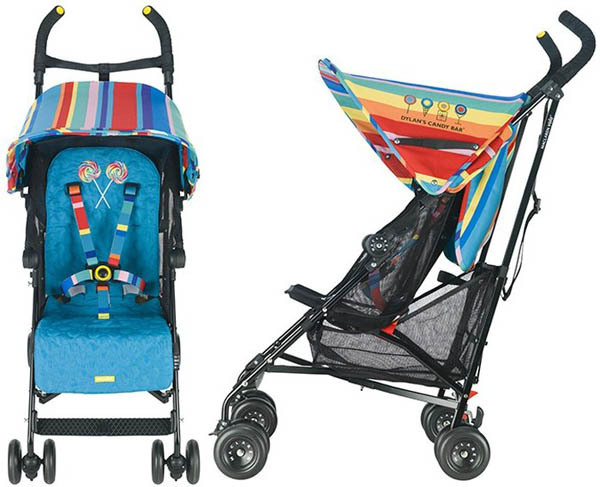 The Dylan’s Candy Bar Maclaren stroller will set you back US$150. For more details and pictures head on over to Dylan’s Candy Bar.